Cortech Developments are pleased to announce a major integration with the Chubb Locks LCMS custodial access control system, Chubb ATLAS®, and its own integrated software solution, Datalog. Chubb Locks Custodial Services [CLCS] is the number one supplier of custodial locks in the UK. CLCS work closely with experts and industry professionals on a global scale in order to design, develop, manufacture, and ultimately install custodial locks in secure establishments both at home and internationally. The driver makes use of the Chubb Locks LCMS .Net API to allow monitoring and control of doors, relays and inputs and to receive ‘live’ notification of a range of events from the LCMS server. By configuring a relationship between a Datalog circuit and an ATLAS® device, features such as opening and closing doors, triggering of relays and other key control events can be managed directly from the Datalog desktop. 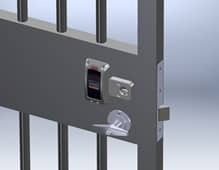 The Advanced Technology Lock Access System [ATLAS®] is a high security, computer controlled electronic access system for prisons and other security establishments. The system comprises intelligent electronic locks, micro-chipped keys called Tokens, a computer network with a server – which holds a database of the entire system – and client PC’s which are used to operate the set up. This system provides complete control of locks and keys as well as reporting and audit trails of all activity within the installation. Each lock, Token and User of the system has a unique identity allowing ATLAS® to monitor all activity. Each lock is assigned a list of Tokens that are allowed to open it. In addition to this each Token has time periods set that determine when it will work. This means that even a correct Token can’t open a lock outside its designated operating time unless these time periods are overridden by the control room staff. The ATLAS® Tokens are micro-chipped and have a unique identity to the system which allows an individual Token or group of Tokens to be temporarily or permanently deleted from the system. This will instantly stop them from working in any lock. This prevents the security of the establishment being compromised if a Token is lost.